We’d love your help. Let us know what’s wrong with this preview of Mothers on the Fast Track by Mary Ann Mason. In the past few decades the number of women entering graduate and professional schools has been going up and up, while the number of women reaching the top rung of the corporate and academic worlds has remained relatively stagnant. Why are so many women falling off the fast track? 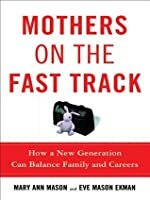 In this timely book, Mary Ann Mason traces the career paths of the first generation of ambiti In the past few decades the number of women entering graduate and professional schools has been going up and up, while the number of women reaching the top rung of the corporate and academic worlds has remained relatively stagnant. Why are so many women falling off the fast track? In this timely book, Mary Ann Mason traces the career paths of the first generation of ambitious women who started careers in academia, law, medicine, business, and the media in large numbers in the 1970s and '80s. Many women who had started families but continued working had ended up veering off the path to upper management at a point she calls "the second glass ceiling." Rather than sticking to their original career goals, they allowed themselves to slide into a second tier of management that offers fewer hours, less pay, lower prestige, and limited upward mobility. Men who did likewise--entered the career world with high aspirations and then started families while working--not only did not show the same trend, they reached even higher levels of professional success than men who had no families at all. Along with her daughter, an aspiring journalist, Mason has written a guide for young women who are facing the tough decision of when--and if--to start a family. It is also a guide for older women seeking a second chance to break through to the next level, as Mason herself did in academia. The book features anecdotes and strategies from the dozens of women they interviewed. Advice ranges from the personal (know when to say "no," the importance of time management) to the institutional, with suggestions for how the workplace itself can be changed to make it easier for ambitious working mothers to reach the top levels. 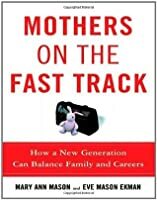 The result is a roadmap of new choices for women facing the sobering question of how to balance a successful career with family. To ask other readers questions about Mothers on the Fast Track, please sign up. There is a lot of data and her conclusions seem well-supported. I wish she would have focused less on college professors and more on other professions. There are other careers with "fast tracks" besides doctors, lawyers, and CEOs. A lot of good data, but the book was strangely written, as if different chapters were by completely different authors who had access to the same data. As in, there's a lot of repetition and seemingly identical passages. Maybe some ghost writing by grad students of Dean Mason's? There are also a lot more typos than I would have expected. I think Maike Ingrid Philipsen's book does a better job of smoothly incorporating qualitative interviews and data into an enjoyable, informative read. All in all A lot of good data, but the book was strangely written, as if different chapters were by completely different authors who had access to the same data. As in, there's a lot of repetition and seemingly identical passages. Maybe some ghost writing by grad students of Dean Mason's? There are also a lot more typos than I would have expected. I think Maike Ingrid Philipsen's book does a better job of smoothly incorporating qualitative interviews and data into an enjoyable, informative read. All in all I still found it interesting, and I think Mary Ann Mason's work at Berkeley is hugely important to most (women) in academia. It's a good book that puts an important topic out there, although it focuses primarily on the white collar occupations. Potential readers should know that before reading. It is focused mostly on tenured professors, lawyers, and doctors. Generally these are the women are in a much better predicament than than their poorer counterparts. another good book on topic of balancing family and careers. My sister gave this book to me for Christmas.